We are excited to share with you our office move this past week, today marks our "official" first day at our new office! How secure is your technology? Cyber security breaches have been flaring up globally impacting elections, major corporations, foreign governments and even national security organizations. The message is loud and clear. Hackers are thriving at the expense of millions of innocent hard working people. We all need to be aware of this and look for ways to protect ourselves better. Rest assured that at MG&A we operate in an advanced and highly secure technological environment. Features such as redundancy, data encryption, virus protection, cyber security protection and 24-hour system monitoring are integral components to not only our technology infrastructure but also our wealth management process. That's right! We believe protecting your wealth isn't just about a well-diversified portfolio, but also includes a well-fortified defense around your data, information, and identity. What about you? How secure is your technology? Statistically speaking, 70% of you will read this blog post through a mobile device. Not surprisingly, tablets and cellphones have become the treasure trove to hackers. Why? YOU make it too easy for them... unknowingly of course. Even a locked iPhone can give hackers very damaging information about you. We're here to help! Below are two links containing easy to follow instructions to protect yourself by securing your mobile devices and reducing your vulnerability to hackers. There are separate procedures for iPhone users and Android devotees (courtesy of JP Morgan). Please share this with family and friends so we can collectively dial down the unnecessary surveillance in our lives. Protecting our identity, security and family are far more important than Siri reminding us to pick up the dry cleaning every Wednesday. Really?! Take a hike Siri...I know you’re listening! 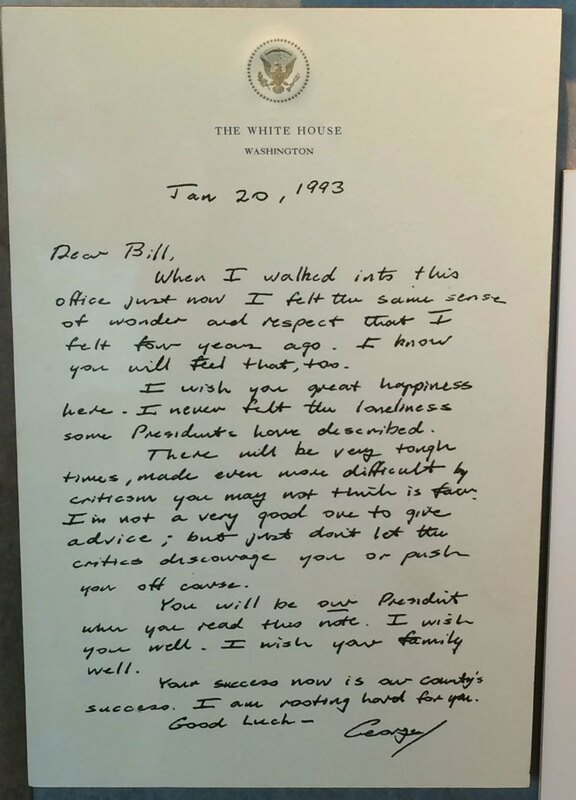 Definition of Class - The letter President George H. W. Bush left on his desk in the oval office on his last day for incoming President Bill Clinton. As we go into the holiday season, I couldn't say it any better than one of my advisors...enjoy his thoughts below. We should be grateful for everything we have. "As the year is winding down, I wanted to go outside the "norm" by taking a moment to discuss gratitude and how practicing it can lead to better outcomes for you and your business. This month more than any other, I find myself reflecting over the past year by looking at ways that practicing gratitude has served me well. To me, gratitude is an action, and I have tried to apply it daily over the past year. For me, when I practice gratitude, it is nearly impossible to get upset or stressed out. This leads to the ability to make more productive decisions! So, gratitude is about the application of it in your life which will lead to successful outcomes. If you apply and practice gratitude in a few simple areas of daily life, it will give you a different perspective, a "new set of glasses" per se, that allows you to be more upbeat, kind, and genuine to everyone you encounter each day. After all, more success is achieved when we genuinely and actively seek to help others succeed. This is basic stuff, but very important. Try to eat foods that will nourish your body instead of attacking it. Try to get enough sleep, and slow down if life is getting too hectic. Taking good care of your body gives you all the energy you need to deal with the demands of the day. A healthy body equals a healthy mind, and a healthy mind produces results. "What can I learn from this experience? ", and "Can I apply the knowledge that I have now after going through this to help anyone else?" After reflecting, take action! If you've learned something from a negative experience, and can help someone else with the knowledge learned from that experience, then it automatically turns the "negative" into a "positive". It's a win, win! This can be tough. You aren't ever going to "like" everyone. You may actually strongly dislike someone. You can still practice kindness by trying to put yourself in the other's person's shoes. This brings tolerance which then allows you to be sincerely kind through respecting the other person's position. This kind of attitude breeds mutual respect which will help form a productive and working relationship geared towards success no matter if you "like" them or not! True gratitude is much more than a state of being. It is a way of living. And, it is a seed for future prosperity. In closing, we would like to sincerely thank you for your support and for being a friend of our agency. We appreciate your like-minded commitment to success and dedication to excellence and are looking forward to building our relationship even more in the future!"